2 - All social icons will appear on your landing page. To select what ones you would like to use, navigate to the properties section to the left of your landing page. Click on the + button to expand the settings for that icon. Set Enable to No to remove the icon. Add the URL for your social medium and select the target for your link when the icon is opened - Same Window or New Window. 3 - To save time, you can pre-save links to your social channels from your settings. 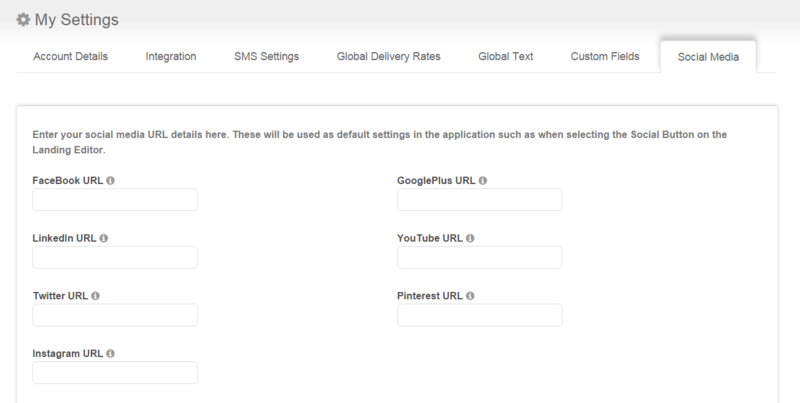 Whenever you add the social widget to your landing page, your links will be pre-populated in the properties section. To do this, navigate to My Settings and select to Social Media tab. Simply add links to your social channels and click Save Details in the bottom right of your screen.